As mentioned in my previous post, The Great Gatsby in Fashion is the full original novel by F Scott Fitzgerald with annotation by Debbie Sessions. It includes 33 additional pages of fashion history insights complete with original color illustrations and photographs throughout. Debbie sent a copy to me last week and I've really enjoyed re-reading my favorite book with her thorough research on fashion of the day and fashion illustrations included. “The love affair with one of the greatest American novels ever written has just as much to do with the dazzling fashions of the 1920’s as it does with great story telling. 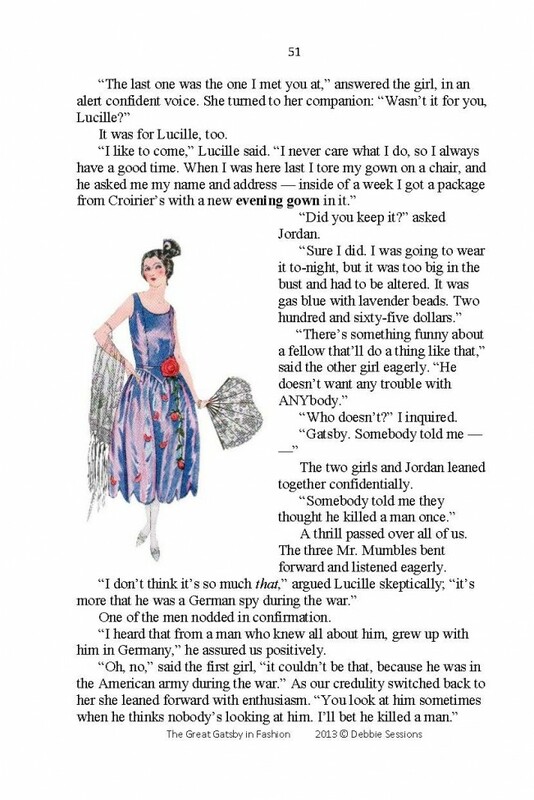 F. Scott Fitzgerald, a dapper dresser, and his wife, Zelda, a notorious flapper, experienced the high life of fashion and culture in the twenties. 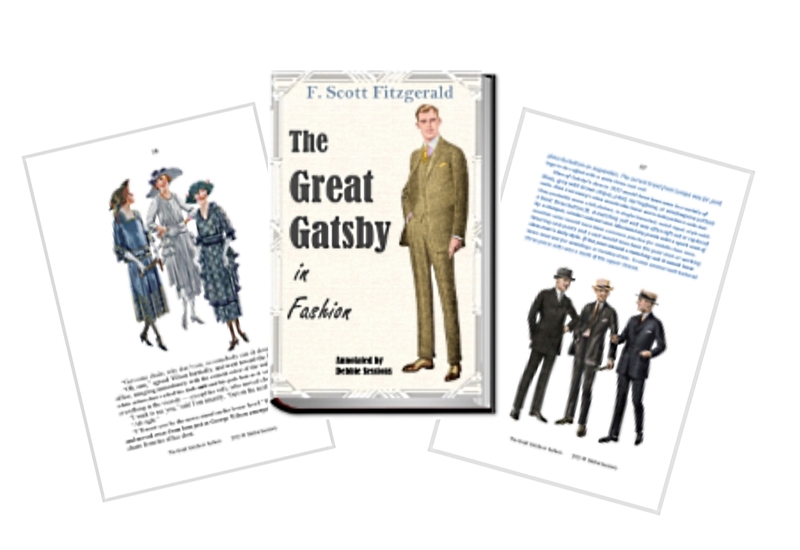 It was only natural for Fitzgerald to include detailed descriptions of the clothing each character wore. It is in his observations of their dress that he unveils the characters’ motivations and morals that play a critical part in the novel. Fitzgerald’s audience in 1925 would have understood what color a “gas blue” dress was and would have known the sound of “clicking pottery bracelets.” Today’s readers miss the cultural context of those fashions, until now. 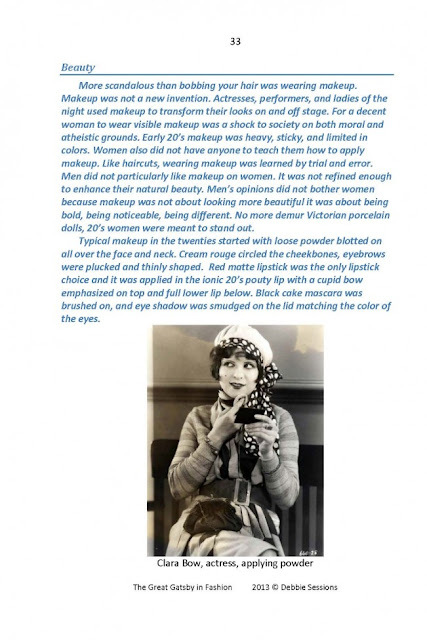 What Gatsby era fashion do you wish would come back in style?" The hats! Oh how I love the hats! I wish it would all come back. Some of the outfits are so detailed its amazing. It should all come back!! Straw hats and bow ties on the men. I have shared on pinterest. I think I love the details of the clothing the most. There was beading and embroidery and lace, but it was classy, not granny like. I love the short bobbed hairstyles and fingerwaves. I wish the 'class' in general would come back. With the way they communicated with each other, and the way that they dressed so respectable. I wish to heavens the hairstyles would come back. I love the finger wave bobs! I wish that everyone desired to dress so classy, including me! OH and the hairstyles are amazing. It's so hard to chose just one, but maybe I just wish that we had the glamorous pieces. Even if it were just a day dress. I wish the entire flapper silhouette would come back. A drop waist is very forgiving. I would love to see all of the amazing beadwork on the clothing and accessories come back into fashion. I love everything from that period especially the suits for men. i love the hats, no more bad hair days! Definitely the hats, but I think the general attention to every single detail should come back, too. It made the garment that much more beautiful! I also shared on Facebook, thanks for the giveaway! Definitely the hats! Hats should be worn everyday!!! Most definitely the head-pieces and hats!! I love a good feather and lace across the forehead band!! I would love for the detalied cloche hats to come back. I see them once in awhile at very high end stores.